Sony returns to form with a sweet portable baseball game. Baseball season is just a few weeks away, and we can already smell the clean-cut grass in the outfield and the six-dollar hot dogs. To get you in the mood for all the home runs, pop-flies and stolen bases, Sony returns with another edition of its baseball series for the PSP, MLB 10: The Show. Last year's game stumbled a bit due to presentation issues and gameplay problems, but it appears that SCEA San Diego paid attention to those criticisms, because the series is back up to speed. 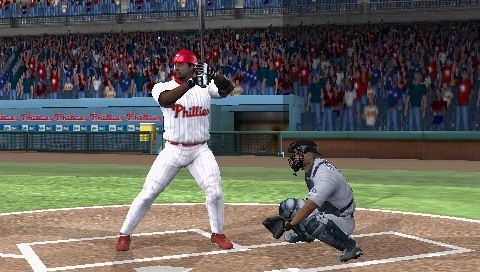 Like its superior PlayStation 3 counterpart, MLB 10: The Show is all about nailing the small intricacies of the sport. Batting feels almost completely natural, with a swing system that's both accessible and challenging. Getting a hit is pretty easy, but locating the "sweet spot" for a home run is still something that takes time, even with a power hitter like David Ortiz at the plate. Likewise, pitching is also user-friendly, once you get used to it. You work with an arc wheel system, and you'll need to press the buttons in just the right places to avoid sailing the ball right over the plate or letting it get away from you with a wild pitch. However, the PSP isn't the most approachable platform for baseball. We're more at home aiming pitches and swings with an analog stick instead of the PSP's clumsy nub. There were times that we had to adjust our pitch because we couldn't get it to slide over one specific spot. Also, the nub makes base stealing more difficult, thanks to minor directional issues. In some instances, we almost got away with a steal, but a wrong press resulted in an accidental out. Regardless, this is more of a hardware issue than a development one, and SCEA San Diego tried to work around this as much as possible. If you're a baseball fan, MLB 10: The Show will give you plenty to do. Along with Exhibition games, you can take charge of your team in Manager Mode, engage in a Season for the pennant, take part in a Home Run Derby or guide your own career through the Road To the Show, creating your own ballplayer from scratch and sending players on their way. You can also join up with a friend in AdHoc for two-player action, although Infrastructure didn't make the cut. Overall, though, there's still a lot to do. Our recommendation is Road To the Show, as it's deep and full of surprises as you progress through a Hall of Fame career. For that matter, Home Run Derby is equally sweet, and helps you become a better hitter. MLB 10: The Show is obviously an inferior looking product compared to the PS3 version, thanks to occasional jaggy textures and minor slowdown. If you can overlook that, however, this is an appealing baseball effort. The players animate nicely (right down to the slides at the plate), the various ball parks look impressive (we're suckers for Coors Field) and the TV-style presentation will make you feel like you're watching an actual broadcast. As for the commentary, it's good, but like the console version, Rex Hudler annoys us. We wish there was a way to shut him up and keep the other two going. The other sound effects, from the organ music to the groovy alternative rock tunes to the cheering crowds, make you feel like you're at a real game. Slip on some headphones and immerse yourself. 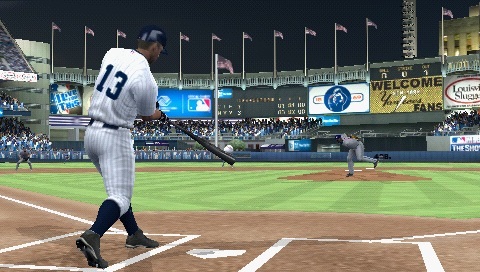 After stumbling a bit last year with MLB 09, Sony returns to form with a better-rounded baseball game. The analog control issues and other small setbacks (Rex Hudler, no Infrastructure play) keep this from winning the pennant, but it's still the go-to batter for on-the-go sports. Take MLB 10: The Show to the ballpark this summer and enjoy. What's Hot: Enjoyable gameplay makes batting and pitching fun, AdHoc mode runs smoothly, lots to do including Road To the Show and Home Run Derby, presentation is good for a PSP game. What's Not: No online multiplayer, analog nub makes some parts of the game frustrating, jaggy visuals, Rex Hudler still annoys us.